The Bombardment of Canton was one of the opening campaigns of the Second Opium War. This was an effort on the part of the British to open Chinese markets to foreign trade, including trade in opium, which the Chinese Government was trying to suppress. 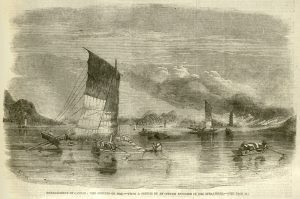 The Illustrated London News, 17 January 1857. Courtesy of University of Missouri Libraries.